Dion Drummonds Aboriginal name is “Moogera”, meaning storm, he is of Torres Strait islander descent on his mothers’ side, and Aboriginal from his father’s side. Dion was born in Mossman (Kuku-Yalangi Tribal area) 80km north of Cairns, Queensland. 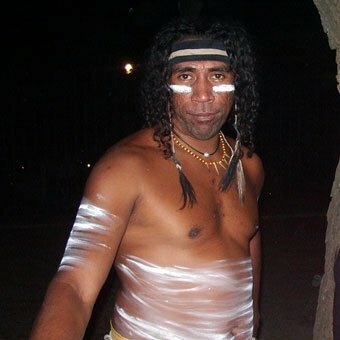 Dion is one of Australia’s most experienced international indigenous performers, covering both Mainland and Islander culture as a dancer, singer and storyteller. Tour of Moscow Australia promotions and performances. Tour of Qatar for The Asian Football Cup. Tour Of Hawaii, Honolulu Festival, Maui Schools, Hilo Palace Theatre. Descendance/Ngaru in (Sydney/Australia): completing Corporate work, International Conventions, Schools, Community Work, Radio Work, Festivals, Jails, Cruise Liners, Workshops, Galleries, Theatre, Museums, Expos, TV, Political Events, Recording, Humanitarian projects for UNESCO and assignments for The Australian Government. Schools around Australia and New Zealand, performing and teaching Aboriginal and Torres Strait Islander culture-Arts Queensland-NGM. NAIDOC Ball and Aboriginal Awards Canberra Convention Centre. New Zealand Tour through Tourism Australia. “Spirits of the Soil” , Dion leads Descendance in its first theatre production, hosting American Crow Indians “Big Day” , production at Bondi Pavilion. Opens the Bellingen Global Festival with Descendance Aboriginal and Torres Strait Islander Dance Co.
“To India with Love” Indian and Flamenco, fusion works, in a tribute concert to India, celebrating the 50th anniversary of India’s liberation from British sovereignty.